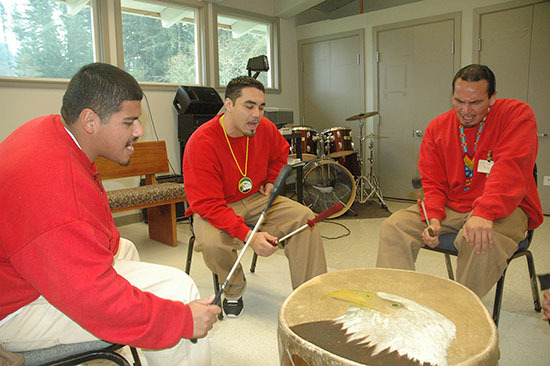 Inmates Fernando DelaCruz, Aaron Abrahamson and George Farrell, members of the Cedar Creek Corrections Center Tribal Circle, sing “The Song of the Eagle”. The tribal circle ceremony is a familiar one for Native Americans, but this setting is not. It’s inside the Cedar Creek Corrections Center, a minimum security prison that houses 480 male inmates. The men, all inmates at the prison, are part of a Native American tribal circle run as part of faith-based programming at Cedar Creek. About 4.6 percent of inmates in Washington state’s Department of Corrections (DOC) prisons identify as American Indians or Alaska Natives. The circle at Cedar Creek has about 35 active members, which represent around 50 tribes, according to Jeffrey Jones, a chaplain at the prison. In addition to playing drums and singing songs, inmates often spend time creating beaded medallions, necklaces and other regalia. Much of it is reserved for an annual pow-wow, to which family members are often invited. There is also an on-site sweat lodge – a hut made from natural materials used for steam baths and prayer in some Native cultures. The department has found that allowing tribal circles has an impact on inmate behavior while they’re incarcerated. Members of the tribal circle have used their culture to benefit the community and charitable organizations, according to Chaplain Jones. For example, members of the tribal circle have made and donated medallions to the Squaxin Tribe to raise money for a fundraiser for cancer research. And earlier this year, inmates made 41 dreamcatchers for graduating students at Lincoln High School, located in Pierce County. He adds inmates in the tribal circle devote a lot of their time learning the songs and dances of various ethnic and religious groups. For example, there are a handful of inmates at the prison who identify as Asian or Pacific Islander and members of the tribal circle often learn their dances and dance with them during on-site cultural events.